Teresa of Avila by Peter Paul Rubens. This painting is on display at the Kunsthistorisches Museum (Museum of Art History) in Vienna, Austria. 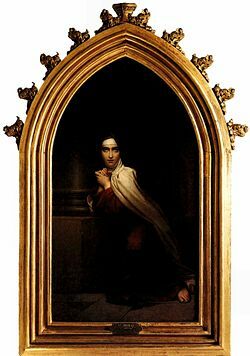 Saint Teresa of Ávila (known in religion as Teresa de Jesús, baptized as Teresa de Cepeda y Ahumada) (March 28, 1515 – October 4, 1582) was a major figure of the Catholic Reformation as a prominent Spanish mystic and writer and as a monastic reformer. She was known for her ecstatic visions and continual life of prayer. Her works, Autobiography, The Way of Perfection, and Interior Castle, written from her personal experiences, exerted a formative influence upon many theologians of the following centuries, such as Francis of Sales, Fénelon, and the Port-Royalists, and are still considered as sources of spiritual guidance by modern Christians. Disillusioned with the lax practices at her Carmelite convent, the Incarnation—where rich nuns had private apartments, jewelry and pets, and where the nuns were allowed male visitors (devotos)–she secured permission to found a separate province of Descalced (shoeless) Carmelites who took a vow of austerities and strict spiritual discipline. She was canonized in 1622 by Gregory XV. In 1970 she was recognized by the Roman Catholic Church as the first woman of the 33 Doctors of the Church. Her feast day is October 15. Saint Teresa was born in Avila, Spain, on March 28, 1515. Her father, Alonso de Cepeda, was the son of a Toledan merchant, Juan Sanchez de Toledo and Ines de Cepeda, originally from Tordesillas. Juan, after being persecuted by the Spanish Inquisition as a “secret Jew,” added “de Cepeda” to his name, bought a knighthood, and transferred his business to Avila, where he succeeded in having his children marry into families of the nobility. In 1505 Alonso married Catalina del Peso, who bore him two children and died in 1507 of the plague. Two years later Alonso married the 15-year-old Beatriz de Ahumada, who bore nine children before dying in childbirth in 1531. Teresa was their third child. Teresa’s family instilled in her the deeply pious and ascetic ideals of the saints and martyrs. When she was seven, she and her brother Rodrigo attempted to run away, intending to go to Moorish territory and be beheaded for Christ, but their uncle encountered them as they were leaving the city and brought them home. Around the age of 12, she became less pious, and conscious of her physical beauty, began to entertain thoughts of marriage. After her mother’s death, her father sent her to study at the Augustinian convent of Santa Maria de Gracia, where she rediscovered her religious feelings. After eighteen months she became ill and returned home to regain her health, staying with her sister and with her father. An uncle acquainted her with the Letters of St. Jerome, which led her to decide on a religious life, more because it seemed the safest course than because the life attracted her. Unable to obtain the consent of her father, Teresa left her parental home secretly one morning in November of 1535, and entered the convent of the Incarnation of the Carmelite nuns at Ávila. Her father yielded to her decision and Teresa took the habit, but soon afterward she became seriously ill. Her father took her to a woman healer in Becedas, with no success. In the fall of 1538, she stayed with her uncle Pedro de Cepeda, who gave her the Abecedario spiritual, commonly known as the "third" or the "spiritual alphabet" (published, six parts, 1537-1554). This work, following the example of similar writings of the medieval mystics, consisted of directions for tests of conscience and for spiritual self-concentration and inner contemplation, known in mystical nomenclature as oratio recollectionis or oratio mentalis. She experienced periods of religious ecstasy through the use of this devotional book, and other mystical ascetic works, such as the Tractatus de oratione et meditatione of Peter of Alcantara and those of St. Ignatius of Loyola. I did not know how to proceed in prayer or how to become recollected, and so I took much pleasure in it and decided to follow that path with all my strength (Libro de la Vida, the autobiography of St. Teresa). Teresa grew even more ill, and her father brought her back to Avila in July 1539. The next month she fell into a coma and was thought to be dead. She revived after four days, but remained paralyzed for three years. After her cure, she practiced mental prayer and had transitory spiritual experiences for about 18 years. She professed, in her illness, to rise from the lowest state, "recollection," to the "devotions of peace" or even to the "devotions of union," a state of perfect ecstasy which was frequently accompanied by a rich "blessing of tears." As the Roman Catholic distinction between “mortal” and “venial” sin became clear to her, she understood the inherent nature of original sin and the necessity of absolute subjection to God. At the age of 39, she began to enjoy a vivid experience of God's presence within her. To the people of Avila, her mystical experiences seemed at odds with her outward appearance. Some of her friends, such as Francisco de Salcedo and Gaspar Daza, suggested that her supernatural experiences were the work of the devil and caused her considerable anguish and self-doubt. In 1555, Francis Borgia heard her confession and told her that the spirit of God was working in her, and that she should not resist the ecstatic experience that came to her in prayer. On Saint Peter's Day of 1559 she became firmly convinced that Christ was present with her in bodily form, though invisible. This vision lasted almost uninterruptedly for more than two years. In another vision, a seraphim drove the fiery point of a golden lance repeatedly through her heart, causing a spiritual and physical pain and joy. The memory of this episode served as an inspiration in her life-long passion to emulate the life and endurance of Jesus, epitomized in the motto usually inscribed upon her images: "Lord, either let me suffer or let me die." Teresa had made a vow always to follow the more perfect course, and resolved to keep the rule as perfectly as she could; however the atmosphere prevailing at the Incarnation convent was not favorable for the life to which she aspired. Inspired by the reforms of St. Peter of Alcantara, who had become her spiritual guide and counselor early in 1560, and by the primitive tradition of Carmel, she resolved to found a Carmelite monastery for nuns, and to reform the laxity which she had found in the Cloister of the Incarnation and others. She enlisted the help of her sister Juana and her sister’s husband Juan de Ovalle to buy a house in Avila and act as though it were for their own occupation, to avoid conflict with the nuns at Incarnation while the building was being adapted to serve as a convent. Funds were provided by a wealthy friend, Guimara de Ulloa. The absolute poverty of the new monastery, established in 1562 and named St. Joseph's, at first excited a scandal among the citizens and authorities of Ávila, and the little house with its chapel was in peril of suppression; but the support of powerful patrons overcame the animosity. In March 1563, when Teresa moved to the new cloister, she received a papal sanction for her founding principle of absolute poverty and renunciation of property, which she proceeded to formulate into a "Constitution." Her plan was the revival of the earlier stricter rules, supplemented by new regulations like the three disciplines of ceremonial flagellation prescribed for the divine service every week, and the “discalceation” of the nuns (the substitution of leather or wooden sandals for shoes). The convent had no endowment and the nuns subsisted only on alms. For the first five years, Teresa remained in pious seclusion, engaged in writing, a time which she described as the most restful years in her life. In 1567 she received a patent from the Carmelite general, Rubeo de Ravenna, to establish new houses of her order. The long journeys which she made through nearly all the provinces of Spain to accomplish this are described in her Libro de las Fundaciones (Book of the Foundations). Between 1567 and 1571, reform convents were established at Medina del Campo, Malagon, Valladolid, Toledo, Pastrana, Salamanca, and Alba de Tormes. In 1571, Teresa was commanded by the Carmelite Provincial to go back to the Convent of the Incarnation in Avila and become its prioress. The nuns at Incarnation were accustomed to electing their own prioress, and Teresa would have preferred to continue her reforms, but she acquiesced. She was an effective and charismatic leader, tightening up discipline and reorganizing the convent finances so that the nuns once again had enough to eat. As the backlash against her reforms increased, the provincial of the old order of Carmelites was sent to Incarnation to prevent Teresa’s reelection as prioress. Of the 99 nuns, 55 voted in her favor. The provincial excommunicated them all and accepted only the votes of the nuns who had opposed her. Following her example, a similar movement for men was begun by John of the Cross and Anthony of Jesus. Another friend, Geronimo Grecian, Carmelite visitator of the older observance of Andalusia and apostolic commissioner, and later provincial of the Teresian reforms, gave her powerful support in founding convents at Segovia (1571), Vegas de Segura (1574), Seville (1575), and Caravaca de la Cruz (Murcia, 1576), while the mystic John, by his power as teacher and preacher, promoted the inner life of the movement. In 1576 the older observant Carmelite order began to react against Teresa, her friends, and her reforms. At the general chapter at Piacenza, the "definitors" of the order forbade all further founding of convents. The general condemned her to voluntary retirement at one of her institutions. She obeyed and chose St. Joseph's at Toledo; her friends and subordinates were subjected to greater trials. After several years of appeals to King Philip II of Spain in 1579, the processes before the Inquisition against her, Grecián, and others were dropped. A brief by Pope Gregory XIII allowed a special provincial for the younger branch of the discalceate nuns, and a royal rescript created a protective board of four assessors for the reform. During the last three years of her life Teresa founded convents at Villanueva de la Jara in northern Andalusia (1580), Palencia (1580), Soria (1581), Burgos, and at Granada (1582). In twenty years her reforms produced seventeen nunneries, all but one founded by her, and as many men's cloisters. Her final illness overtook her on one of her journeys from Burgos to Alba de Tormes. She died at Alba de Tormes (province of Salamanca), the night of October 4 to October 15, 1582, while Spain and the Catholic world switched from the Julian to the Gregorian calendar. She was interred at Alba. Her heart, hands, right foot, right arm, left eye and part of her jaw are on display in various sites around the world. Forty years after her death, in 1622, she was canonized by Gregory XV, and her church reveres her as the "seraphic virgin." The Cortes Generales exalted her to patroness of Spain in 1617, and the university previously conferred the title Doctor ecclesiae with a diploma. The title is Latin for "Doctor of the Church" but is distinct from the honor of Doctor of the Church conferred posthumously by the Holy See, which she received in 1970, becoming the first woman to receive the award. Teresa is unique among the writers on mystical theology. She did not attempt to establish a philosophical system, and her works do not show the influence of the aeropagite, patristic or scholastic mystical schools, though her thought was sometimes directed by her confessors, many of whom belonged to the Dominican Order. She simply wrote from her personal experiences, with deep insight and clarity. Her works were intended to instruct and inspire her followers, and in some cases, to demonstrate her spiritual state to her directors. The mysticism in her works exerted a formative influence upon many theologians of the following centuries, such as Francis of Sales, Fénelon, and the Port-Royalists. Teresa’s works have gained a steadily widening audience from the sixteenth century to the present. She wrote in common Castilian, with rich but simple imagery. Her spiritual strength and her personal honesty add power to her words. Her writing was humorous and intelligent, and dominated by her love for God. Her successive works reflect the changes in her own spiritual attitudes and her increasing personal maturity, and should be read in context. Her Autobiography, written before 1567 under the direction of her confessor, Pedro Ibanez, was originally intended as a manifestation of her spiritual state for her directors, but was later expanded for a larger audience. Chapters 11 through 22 were added later, and depict the different stages of the life of prayer in terms of the ways in which water is obtained to irrigate a garden. The “first water” of beginners is laboriously drawn by hand from a well and carried in a bucket; the “second water,” the “prayer of quiet” or acquired contemplation, is drawn from the well with the help of a windlass; the “third water,” “sleep of the faculties,” is compared to irrigation by means of a stream or river; and the “fourth water,” rain, is a state of passive union of the soul with God. Relations (Relaciones), an extension of the autobiography giving her inner and outer experiences in epistolary form, is usually included in editions of the Autobiography. Way of Perfection (Camino de Perfección), also written before 1567 at the direction of her confessor, was composed during her years in her first convent of St. Joseph's at Avila, as a guide to the monastic life. Her cell there did not contain a table or a chair, so she wrote while kneeling on the floor at a window ledge, with no re-reading or editing. This book is sometimes referred to as the essence of Teresa’s ascetic doctrine. It outlines the virtues which should be cultivated in religious life, and elaborates on the practice of prayer, using the Pater Noster as a vehicle for teaching greater depth in prayer. The Interior Castle (El Castillo Interior), written in 1577, compares the contemplative soul to a castle with seven successive interior courts, or chambers, analogous to the seven heavens. The Trinity dwells in the center of the castle, and the progression through each of the seven chambers (or mansions) represents deeper intimacy with God. When a person arrives at the center, he has attained his maximum capacity for union with God and is “at the center” of himself, having integrity as a human being and as a child of God. 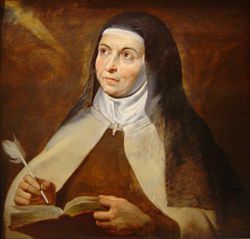 Teresa also wrote shorter works, Concepts of Love, (Conceptos del Amor); Exclamations of the Soul to God (Exclamaciones, 1569), rhapsodic meditations; a commentary on the mystic significance of the Song of Solomon; the Constitutions, for the Discalced Carmelite nuns; and Method for the Visitation of Convents of Discalced Nuns. Her 342 letters, Cartas (Saragossa, 1671), are much loved by readers for their briskness, wisdom, and sense of humor. Teresa's prose is marked by an unaffected grace, an ornate neatness, and charming power of expression, placing her in the front rank of Spanish prose writers; and her rare poems (Todas las poesías, Munster, 1854) are distinguished for tenderness of feeling and rhythm of thought. The kernel of Teresa's mystical thought throughout all her writings is the ascent of the soul in four stages (Autobiography, chap. x.-xxii.). The first, or "heart's devotion," is that of devout contemplation or concentration, the withdrawal of the soul from without, and especially the devout observance of the passion of Christ and penitence. The second is the "devotion of peace," in which the human will is lost in the will of God by virtue of a charismatic, supernatural state bestowed by God, while the other faculties, such as memory, reason, and imagination, are not yet secure from worldly distraction. While a partial distraction is caused by physical performances such as repetition of prayers and writing down spiritual inspirations, the prevailing state is one of quietude. The "devotion of union" is not only a supernatural but an essentially ecstatic state. In this state, reason is also absorbed in God, and only the memory and imagination are left open to the physical world. This state is characterized by a blissful peace, a sweet slumber of the higher faculties of the soul, a conscious rapture in the love of God. The fourth is the "devotion of ecstasy or rapture," a passive state in which the consciousness of being in the body disappears (2 Cor. 7:2-3). Sensory activity ceases; memory and imagination are also absorbed in God or intoxicated. Body and spirit are engulfed in a sweet, happy pain, alternating between a fearful fiery glow, a complete impotence and unconsciousness, and a spell of strangulation, intermitted sometimes by such an ecstatic flight that the body is literally lifted into space. After half an hour this is followed by a reactionary relaxation of a few hours in a swoon-like weakness, during which all the faculties are negated in the union with God. From this the subject awakens in tears; it is the climax of mystical experience, a trance-like state. Saint Teresa was the inspiration for one of Bernini's most famous works, The Ecstasy of St. Theresa, in Santa Maria della Vittoria in Rome. Saint Teresa features prominently in Joan Osborne's song with the same name. She is also a principal character of the opera Four Saints in Three Acts by composer Virgil Thomson and librettist Gertrude Stein. Author R. A. Lafferty was strongly inspired by El Castillo Interior when he wrote his novel Fourth Mansions. Quotes from St. Theresa's work are frequently used as chapter headings. Teresa of Avila, Kieran Kavanaugh and Otilio Rodriguez (trans.). Collected Works of St. Teresa of Avila, Vol. 1. ICS Publications, 1976. Teresa of Avila, Kieran Kavanaugh and Otilio Rodriguez (trans.). Collected Works of St. Teresa of Avila, Vol. 2. ICS Books, 1980. History of "Teresa of Avila"
This article was originally based on the text in the Schaff-Herzog Encyclopedia of Religion. This page was last modified on 19 November 2015, at 17:16.